ETERNA LAW is a European full-cycle law firm possessing strong expertise in the CIS region. 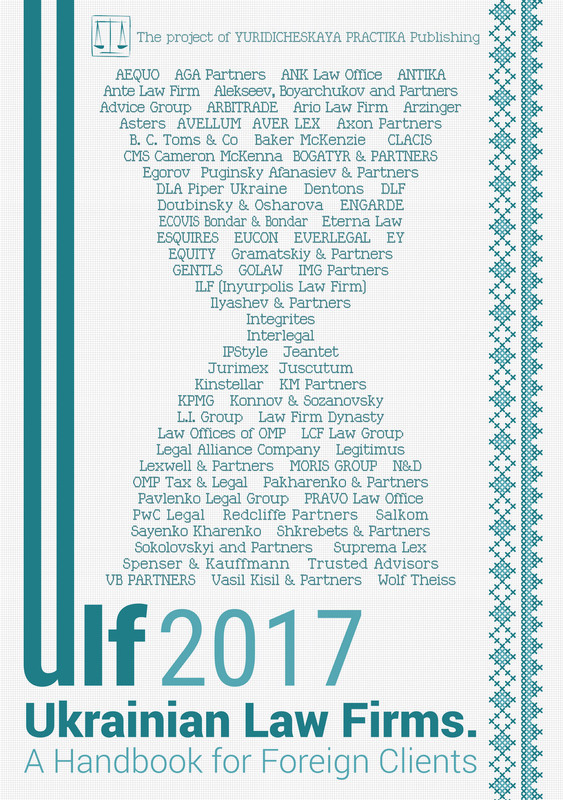 Founded in 2002 in the Ukrainian capital, the firm grew rapidly and currently employs over 100 professionals in 5 active offices (Kyiv, Moscow, Almaty, Riga, Dusseldorf). We are continually named among the leaders of the market for quality, responsiveness and reliability of service as well as for the depth of our expertise. We are a dynamic, client-oriented and solution-focused firm whose team of energetic, foreign-educated young professionals provides concise and practical legal advice in a cost-effective manner, while not compromising on quality. ETERNA LAW has an extensive history and experience within the CIS region. We understand these diverse markets, which demand international experience from a law firm in unison with knowledge of local business realities and the legal environment. It is for this reason that we consistently act in some of the most high-profile matters in the CIS for a broad range of clients, such as international financial institutions and corporations across various industry sectors, Government entities, non-governmental organizations, etc. “Trust, but verify” is a famous dictum of the 40th President of the United States, Ronald Wilson Reagan. This saying is what SME and large business owners should be armed with. Global statistics show that companies lose an average of up to 5% in annual receipts due to wilful misconduct by their employees at senior, middle or junior management levels. Fraud prevention practices will lead you straight to more efficient and higher margin business. Since what you save is what you earn, more earnings could come not only from lower costs, but from ‘wastage and leakage’ optimisation. Statistics also say that those caught in theft are generally first-timers — only 5.3% of thieves have been got caught before, and only 8.3% of those caught were fired. In 40.7% of cases entities do not call in the police for fear of damaging their business reputation. Just 23.1% of cases ended up in civil courts, and the outcome of 80.3% of them was victory for the plaintiffs. The fraudulent conduct larger businesses most commonly encounter is corruption, while small entities often suffer from such theft schemes as stealing cash, cheque forgery, and others. In departmental terms, abusive practices are most common among accountants, sales managers, lawyers, top executives, procurement specialists, financial officers, and customer carers. What should Be Done about Theft? The primary axiom is that you can’t root out theft completely, but you can minimise it through a set of forensic audit procedures. Forensic auditing is both the art and science of investigating and preventing fraudulent conduct in which managers of major companies are often involved. A forensic audit helps to identify potential problems through financial due diligence or legal due diligence on finances and other issues. Its aim is to examine the business environment, both internal and external (corporate intelligence), investigate related persons, and analyse changes in the CEO’s financial situation. According to statistics, corporate theft is usually deep-rooted and seems to be discovered only after crimes have been committed. Sometimes there are just amusing examples of out-of-the-box thinking. The owners, however, rarely take anti-fraud measures to prevent such practices in the future. — undercover audits — auditors go undercover to work as new employees in one of the company’s departments. Although the latter requires more time and effort, it is actually more effective and efficient. While working undercover, the “employee” can try and find out lots of interesting things during quiet, low-profile conversations. Where and why stealing occurs more often. The answer to the “where” question is Procurement, since it has been a thief’s goldmine since the beginning of time. A company could suffer a great deal of financial pain without tendering processes as there are more loopholes for thieves. Close attention should also be paid to the company’s cash transactions (if any). There is a rule among forensic auditors: if you want to find fraud, follow the green stuff. Running due diligence on a counterparty will help identify signs of sham transactions. To do so, you will need in-house financial controllers who will analyse each and every proposed transaction. — engage a reputable international accounting firm to audit financial statements annually. — hidden, inflated obligations are created to go into bankruptcy or have a freezing order issued over assets. I would like to go into detail about fraud related to business lending procedures. There are both corporate and bank loans which are equally attractive for fraudsters. When it comes to checking a credit transaction for compliance, the parties wonder whether it is worth the time and money to ‘discover’ what they already know. In some cases, they can be right — an audit of loan agreements or related documents does not always identify any adverse circumstances. It should, however, be noted that there are quite significant arguments for the conduct of such audits. Preliminary due diligence is better than court proceedings. Most commonly, the parties to a transaction enter into a loan agreement, relying only on standard warranties specified in the agreement. If something proves to be wrong, the borrower will keep the money, but the bank will apparently have to take legal action if the borrower refuses to comply with the requirements of the bank. Litigation will take a lot of time and money, and there is no guarantee that the bank will eventually succeed in the proceedings. In addition, even if collateral is available, it does not necessarily means that it will compensate the bank for its loss. Often it is hard to find signs of fraud or important information being hidden. The fact is that an in-house auditor can perform his or her functions as a mere formality and can, in some cases, be in cahoots with fraudsters, while the granting of a loan is preceded by a systemic analysis of how the business was set up and its assets, including pledged ones, were formed, an evaluation of the borrower’s reputation and that of its managers and owners, and checking the existence of any assets, related parties, including in other foreign businesses. The discovery of any previously unidentified problems is crucial to conducting due diligence as part of a forensic audit. Experience has proved that the number of good faith borrowers paying adequate attention to the disclosure of information as may be necessary for obtaining loans is increasing. But not every company engages experts to conduct due diligence on all aspects of its activities and to identify if there are any significant legal risks. A borrower can be under the illusion that his business is doing well until a previously unknown problem is uncovered. Corporate decisions can involve huge legal risks if they are made by unauthorised persons or are in conflict, whether in whole or in part, with procedures for the acquisition of any particular assets. Practice, however, shows that it can be quite difficult to discover such facts, especially if the borrower is willingly attempting to hide such information. But one thing is clear — if you rely on warranties and indemnities, you will probably overlook signs of fraud or other violations, while preliminary due diligence can point to major legal risks that are likely to affect the closing of a transaction or the extent of necessary warranties. Neglect of collateral quality is a common practice. Such neglect can be due to fraud, carelessness or a lack of knowledge on the part of bank officials. Banks regularly face falsification of collateral documents or resulting pledge releases due to poor risk analysis by management. Legal due diligence will help to uncover any collateral-related risks and to decide whether to grant a loan or set out obligations and warranties to such extent as may be required for the mitigation of risks related to the loss of collateral. For lending purposes, it is also necessary to take seriously the analysis of all of a group’s companies and the loans of borrowers, because cross-defaults under other loan agreements, if any, may result in lost opportunities to enter an international capital market. Another frequent major problem pertaining to due diligence lies in resources, as the analysis of all significant legal risks can be a time-consuming process and the bank could, therefore, experience staff shortages to have the audit conducted using its own efforts. Consequently, many significant risks can go unnoticed, including willingly. The engagement of professional advisors will allow you to ensure that independent legal due diligence will cover major transaction issues. The most important thing is that you should not immediately hold liable a thieving manager you have just uncovered — you’d better take time-out and wait until he or she probably hands over his/her partners in crime. Just remember that a forensic audit is a dish best served cold.